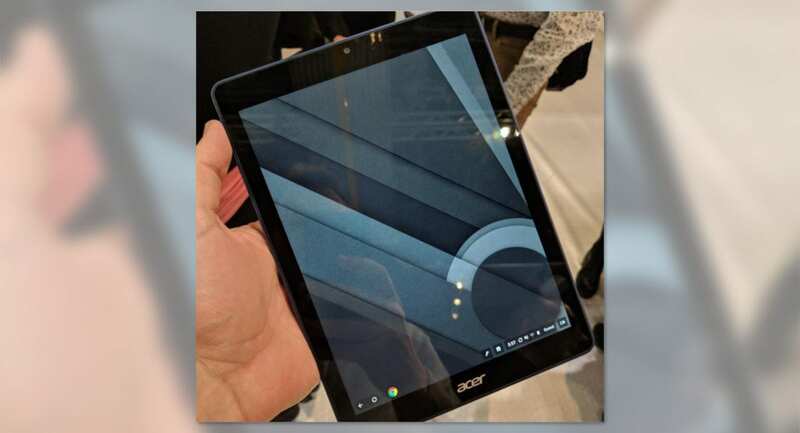 Just about a week ago, the first eyes-on of the Acer Chrome OS tablet leaked from the BETT show in London. The tweet has been pulled, but we’ve heard plenty of folks saying they saw this device in the flesh at the show as well. Our leaning is this mystery device is none other than the ‘Scarlet’ tablet we’ve been tracking for over a year now. Pen support, stowable stylus, and internal chipset all point to the fact that what we’ve seen at BETT is, in fact, ‘Scarlet’. Making that connection allows us to make yet another detail about this tablet discernable, but we’ll get there. First, I want to run down the things we know about ‘Scarlet’ as it has been a while since we’ve talked much about it. One place we’ve yet to nail down final details on is the screen. Both the size and resolution have been tested on quite a few models over the course of the last year. Many things we’ve seen to this point seemed to be nudging us towards an 8-inch form factor, but that was always a bit puzzling to me. Since the show in BETT, we had an anonymous tipster inform us that they spent a few minutes with the Acer tablet at the show and can confirm it’s nearly-10-inch size, giving us some fresh perspective to use when combing through the repositories. It is clear when reading this commit fully that the devs are working through a current issue with the display and waiting on Innolux to provide a fix. At this point in the game, assuming the Acer tablet is ‘Scarlet’, I doubt they are still testing random displays. Also, take into consideration this commit is only 26 hours old as of the writing of this post. With the tablet physically being at BETT, we’re left to wonder if this programming issue cropped up before the show and Acer was forced to pull it from their booth last minute. If so, I’d imagine we’ll see the official unveiling very, very soon. The most interesting thing in this commit, however, isn’t the issue being highlighted. It is the exact model number of the display being used. Innolux P097PFG. Search the internet and you won’t find much about this specific model, but there are a few details if you look close enough. According to a post by Li Huang of Rockchip over at freedesktop.org, you can see a few details about this exact display: 3 to be specific. Based on the info we received from our tipster, all the ways this device lines up with what we know about ‘Scarlet’, and what we’re seeing as the most current inner-workings from the developers, I feel quite confident that we’ve uncovered another piece of the ‘Scarlet’ puzzle. One thing is quite certain: this new tablet from Acer is shaping up to be quite an intriguing device. It is yet to be seen how Acer will handle the keyboard/trackpad part of the equation at this point. Will they have a few official accessories? Will users be left to find their own solutions? The tablet and detachable Chromebook scene is basically the Wild-Wild West at this point, so it is very hard to say. At first, it seems, Acer is looking to position this device to go into the classroom and do battle in the places where iPads are still holding residence. What about you? Are you interested in owning a Chrome OS tablet? With a feature set similar to Samsung’s Chromebook Plus, would you rather have a dedicated tablet or a convertible? Let us know in the comments!